aquaBRIGHT is a pneumatically applied thermal plastic coating. The raw material is in a dry powder form that is propelled through a gun-type applicator and heated onto the pool surface. The material dries almost instantaneously ideal for our pool renovation equipment. The thermal spray applicator was specifically designed to produce a polymeric coating using our aquaBright thermal plastic powder. The finishes are easily applied with our proven installation methods and the end result is a smooth and durable astoundingly beautiful finish that will last for many years to come. 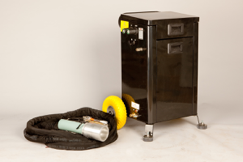 Compressed air and LPG are the only requirements to operate the thermal spray equipment. A small vehicle or trailer is all that is needed to transport the Thermal Spray applicator and all aquaBRIGHT materials. A typical crew can easily install at a high output rate of around 20 sqm/hr. A standard average size pool can be coated within a day. A large powder feeder hopper reduces the need to constantly supplement additional powder. The gun hose has a lengthy umbilical line capable of reaching many areas in the pool, while the unit remains stationary. This unit is compact for easier transport and storage. The large pneumatic tires make it effortless to manoeuvre across a multitude of terrains. The compact size allows you to get into tight areas that other bulky coatings equipment cannot. Note: All machines used in Australia must be Gas Appliance Approved.